Here’s something that will brighten your day. An American tourist got mega-lucky while visiting an elephant sanctuary in Chiang Mai, Thailand and got some pretty hilarious cuddles from one of their baby elephants. 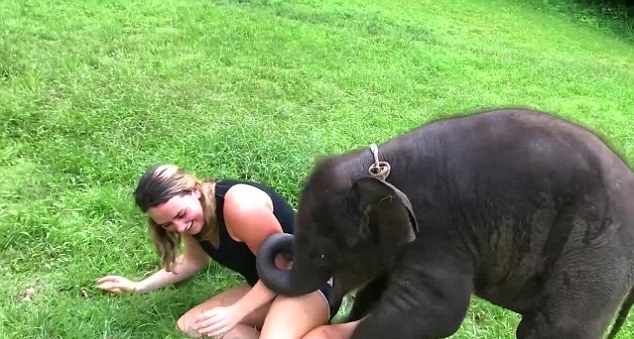 The video footage is both hilarious and supremely adorable and shows the tourist rolling around and generally having a lovely time with Suki, a very young elephant, at the Chia Lai Orchid, a sanctuary that rescues elephants. I mean, that could be a real concern. Even though Suki is only a very young elephant, she could weigh anything up to about 200 pounds. 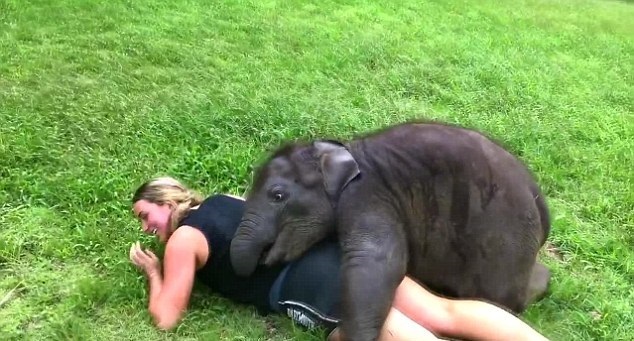 Suki was clearly enjoying playing with her new friend, pushing her trunk into her and trying to grab her, as well as rolling the American woman around on the floor. For the woman’s part, she just can’t stop laughing and is clearly enjoying her elephant sanctuary experience. They then head over towards Suki’s mother, who is clearly not too bothered about the whole thing. She is presumably glad that somebody else is looking after the baby for a while whilst she has a rest. Then, the tourist’s friends arrive and they all sit about stroking the baby elephant. It’s pretty touching stuff. It’s all for a good cause, as well. The Chia Mai Orchid elephant sanctuary does good work out there in Thailand. There are a lot of elephants that are in need of rescue. They also do work to stop cruelty of a different kind, towards humans. A description explaining the video says: “The Chai Lai Orchid is a business that works to rescue elephants and fight human trafficking. There you go, if you want to do some good work and also spend some time hanging out with baby elephants, you know where you have to go. That’s it, I’m off to Thailand to play with the baby elephants. Please tell my family that they’ll never hear from me again.